In some parts of the UK, as Christmas approaches, people still sing traditional carols in pubs and streets. They are often old carols from the 18th century or earlier not known outside the local area. For the last few years the Glasgow folk/world harmony group Muldoon's Picnic have hosted a singing event in a pub showcasing these earlier, "non-tacky" styles of Christmas music, open to all to join in. There's an optional workshop beforehand for those who'd like the chance to practise, which is hosted in the West End by Voicebeat and on the South Side by Govanhill Voices. This event is ideal for those who don't like Christmas music, or think they don't, as well as for those who like to claim they can't sing and have no interest in performing — it's purely for fun and not to please an audience. It's a celebration of Christmas from a time before commercial music, taking in west gallery carols from Yorkshire to Cornwall, Welsh plygain and American shapenote songs, along with seasonal world music from places such as Eastern Europe and the Caucasus. No tinsel will be harmed, and red-nosed reindeer need not apply. Unusually for anything involving Voicebeat or Muldoon's Picnic, musical instruments will be welcome. 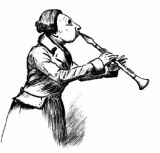 The aim is to sound something like the village church bands of the 18th century and earlier, so no guitars or electronic gizmos, but if you can play something such as fiddle, cello, clarinet, flute or bassoon, please bring it along. Especially if you play the serpent. The music is not difficult, so you won't need to be a virtuoso. If you can read music you should be able to turn up and play (or sing) it with no problem, and we can always send out scores in advance if you want them. For anyone who'd like the chance for a quick practice first, there will be two workshops before the pub nights: one on the South Side with Govanhill Voices, and one in the West End hosted by Voicebeat. Appropriate instruments (see above) will be very welcome too, but there won't be any instrumental tuition, so you'll need basic music-reading skills. No advance booking needed. No booking required for any of the above events, just turn up. Scores, recordings, MIDIs etc of some of the songs we may sing here. But remember you had to be there — this is very much music to take part in, not listen to, so come and sing/play it for yourself.